The creation and evolution of the educational role of the Cambridge Anatomical Museum. The interior of the Department of Anatomy at Cambridge University. Photograph, 1888/1893. Wellcome Library, London. believed that ‘Anatomy cannot be taught without a museum, and the more extensive the better…’1Frederick John Knox, The Anatomist’s instructor, and museum companion: being practical directions for the formation and subsequent management of Anatomy Museums (Edinburgh: Adam and Charles Black, 1863), 5. However, due to the changing attitude toward medical education favouring clinical and laboratory medicine in the 1900s, the use of these collections for teaching became scarce. 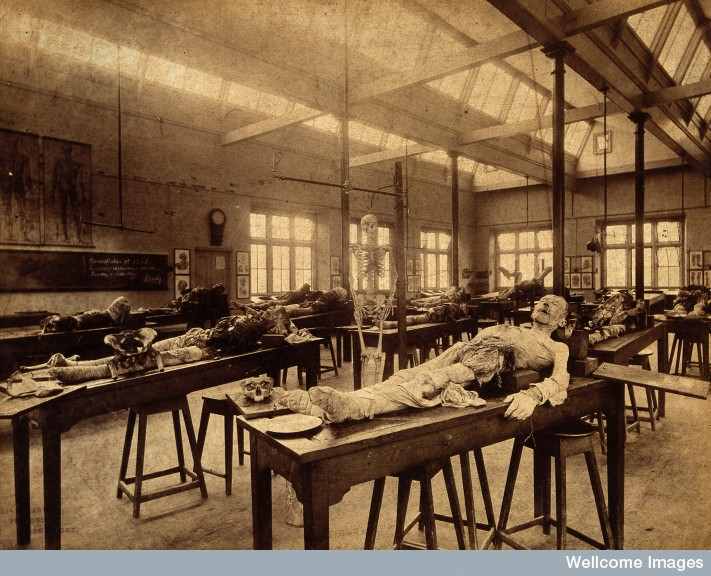 This paper aims to explore the influencing factors behind the assemblage of anatomical preparations for teaching purposes at the University of Cambridge and how the collection and its‟ role in education changed over time. Since its origin in the mid-1700s, the collection at the University of Cambridge was heavily influenced by the individual research interests of the Professors of Anatomy; Sir Busick Harwood, William Clark and Sir George Murray Humphry. With their common goal of providing better teaching facilities, these men compiled an extensive and varied collection through great personal effort and funds. During the mid 1800s several collections were purchased to fill the „gaps‟ in the collection. This included the collection of James Macartney from Trinity College Dublin and part of the Joshua Brooke‟s Museum. Anatomical preparations for the museum were also created in house by retaining elements from dissections carried out by both skilled anatomists and students. As the educational environment changed in the late 1890s, curators Alexander Macalister and Wynfrid Laurence Henry Duckworth, both embraced anthropological research. After a gradual decline in its use the Anatomical Museum was dissolved and the osteological portions were given to the Department of Physical Anthropology in 1968, where this collection remains a valuable teaching resource. Today, research on the collection is underway which examines the cut marks on the osteological material providing information on human dissection practices. This presentation shows how the content of the Anatomical Museum at the University of Cambridge evolved from human anatomy, to human-animal comparative anatomy, and then to human material. Specifically this presentation focuses on the anthropological comparative anatomy of different human races and archaeological material, and that although anatomical museums are no longer considered essential to medical education, that these historic collections can still be used for educational purposes. ← Botanic Gardens as Spaces and Places of Medical Teaching – The Example of the Glasgow and Edinburgh Botanic Gardens.